**Immersive, mysterious new age-y synth zones and knackered ambient techno, strongly tipped to fans of Sand Circles, 1991 or Andy Stott** "The billowing, cloaked drones of Michael Bailey's low-burning Invisible Path have always felt a bit out of step amidst the tweeting, energy drink-sponsored hustle of the L.A. music scene, which is perhaps what's allowed it the freedom to ferment and fortify into such a singular, vibrational force. 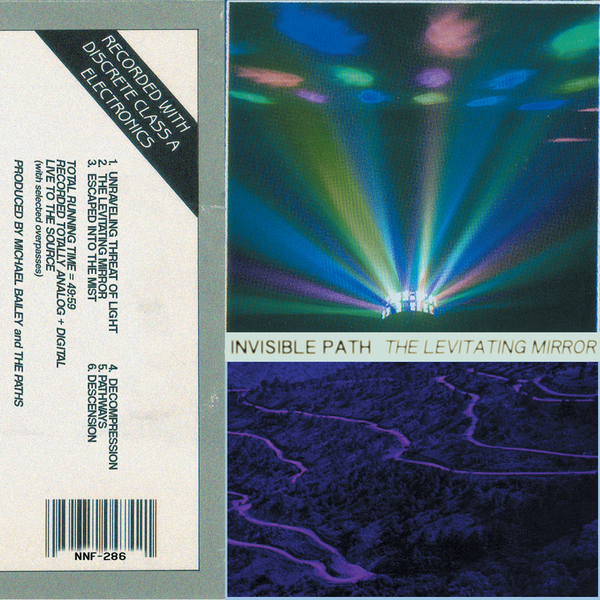 Past shows staged in pure darkness with bowed gongs and vibrational amplifier worship hinted at the potency of the project but nothing in the IP oeuvre prepared us for the enveloping, textural infinities and planetary pulsations of The Levitating Mirror. Translucent electric mists undulate while sub-bass synth heartbeats throb sparsely and a distant, clanging metal metronome reverberates in the sky. The submerged rhythmic dimension of these pieces gives them a fascinatingly shadowed sense of motion, like some obscenely abstract ambient techno record pitched to 12 BPM. The mood moves from meditative and mesmerized ("Unraveling Threat Of Light") to drugged and dissolved ("Escaped Into The Mist," "Decompression") before plummeting to industrialized, subterranean blackness ("Descension"). One of the most transportive headphone bio-domes we've heard in multiple years, hands down. Plug into the Path."